What is Cytospora canker? 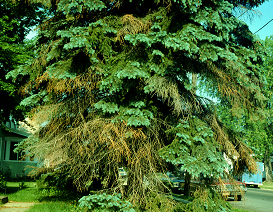 Cytospora canker is one of the most common fungal diseases of Colorado blue spruce. This disease can also affect Engelmann, Norway and white spruce, as well as balsam fir, Douglas-fir, European larch, tamarack, and white pine. Trees that are 15 years old or older and are at least 20 feet high often show symptoms of Cytospora canker. The disease often makes trees look so unsightly that owners will have the trees removed. Death of lower branches of Colorado blue spruce typical of Cytospora canker. What does Cytospora canker look like? Cytospora canker usually first appears on lower branches and progresses up the tree. Individual upper branches may show symptoms as well. Needles on infected branches turn purple, then brown and die. Diseased needles eventually fall off and infected branches die. Infected branches often ooze a bluish-white sap somewhere along their length. Where does Cytospora canker come from? Cytospora canker is caused by the fungus Cytospora kunzei (also sometimes referred to as Leucocytospora kunzei or Leucostoma kunzei). The fungus survives in infected branches and spores are spread by wind, rain splash, insects, birds, and mammals. How do I save a tree or shrub with Cytospora canker? Immediately remove and destroy any diseased branches by pruning them using the three-point method of pruning (see University of Wisconsin Garden Facts XHT1014, “How to Properly Prune Deciduous Trees”, for details). Prune only in dry weather. Between cuts, decontaminate pruning tools by dipping them for at least 30 seconds in 10% bleach or (more ideally) 70% alcohol (e.g., rubbing alcohol). Spray disinfectants that contain at least 70% alcohol also can be used. Spray tools until they drip and then allow them to air dry. Decontaminating tools will help prevent movement of Cytospora kunzei from branch to branch and from tree to tree during pruning. How do I avoid problems with Cytospora canker in the future? Perhaps the easiest way to avoid Cytospora canker is through proper tree selection, planting and maintenance. Avoid planting a full-sized variety of a Cytospora canker susceptible tree, particularly a full-sized variety of blue spruce. Instead consider planting a dwarf tree variety. A smaller tree will have a canopy where air will more easily penetrate into the interior, thus drying branches and needles more rapidly. In general, a drier environment is less favorable for disease development. If you choose to plant a full-sized tree, leave adequate space between the tree and other trees in your landscape. Proper spacing will provide good air flow and again promote drier conditions that are less favorable for disease. Optimally, when trees are full sized, they should be far enough apart so that branches do not overlap. Once a tree becomes well established, selectively prune branches to open up the tree’s canopy to further promote a drier environment. Bluish-white ooze often is present on branches affected by Cytospora canker. Also minimize environmental stresses to any tree susceptible to Cytospora canker. Prevent water stress by avoiding soil compaction and by ensuring adequate soil drainage. During dry periods, make sure your tree receives approximately one inch of water per week either from natural rain or by applying supplemental water at the drip line of the tree (i.e., the edge of where tree branches extend) and beyond using a soaker or drip hose. To help maintain proper soil moisture, mulch out to at least the drip line of the tree. Use one to two inches of mulch on a heavier, clay soil; use three to four inches of mulch on a lighter, sandy soil. DO NOT pile mulch against the trunk of the tree; keep mulch approximately four inches from the trunk. Prevent nutrient stress by properly fertilizing your tree based on a soil fertility test. The University of Wisconsin Soil and Forage Laboratory (http://uwlab.soils.wisc.edu/) can assist with soil and plant tissue fertility testing, as well as provide fertilization recommendations. DO NOT use fungicide treatments for Cytospora canker control; fungicide treatments are not effective. 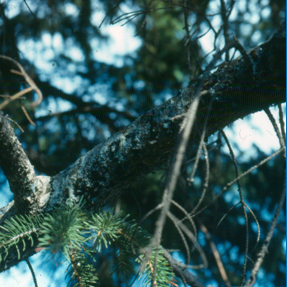 For more information on Cytospora canker: See UW-Extension Bulletin A2639, “Colorado Blue Spruce and Other Spruce Disorder: Cytospora Canker” (available at http://learningstore.uwex.edu), or contact your county Extension agent. Thanks to Diana Alfuth, Jean Ferdinandsen, Lisa Johnson, Amy Sausen and Ann Wied for reviewing this document.